At NuVet Labs®, we realize that proper nutrition and supplementation is critical to optimizing the health of our beloved companion pets. With that in mind, we created NuVet Plus®. 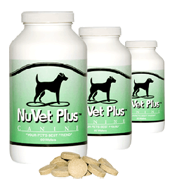 The synergistic formula of NuVet Plus® ingredients was researched and developed over an 8 year period by a team of industry professionals, with the purpose of creating a comprehensive supplement for dogs and cats that would provide much more than simply the minimum levels of nutrients required to sustain life. Instead, NuVet Plus® supplies a powerful combination of natural ingredients designed to provide complete nutritional wellness and optimal immune system support. We know that pets are just as vulnerable to bone, joint, and mobility issues as are their human counterparts, which is why we developed NuJoint Plus®. 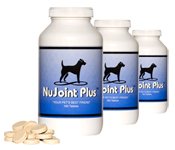 NuJoint Plus® offers powerful bone and joint support for pets.